Running a website comes with its own responsibilities. You have to care about who gets to visit your pages. If you are posting material that could potentially get you in legal trouble or may not be suitable for everyone in your audience, you should take time to warn your visitors beforehand. Content Warning for WordPress is a cool plugin that adds a dialog box with your warning inside. Content Warning uses AJAX & Thickbox to display your message. Your visitors will have the option to enter or exit your site after they have seen your warning. This tool gives you the option to make your visitors see your message in each session. 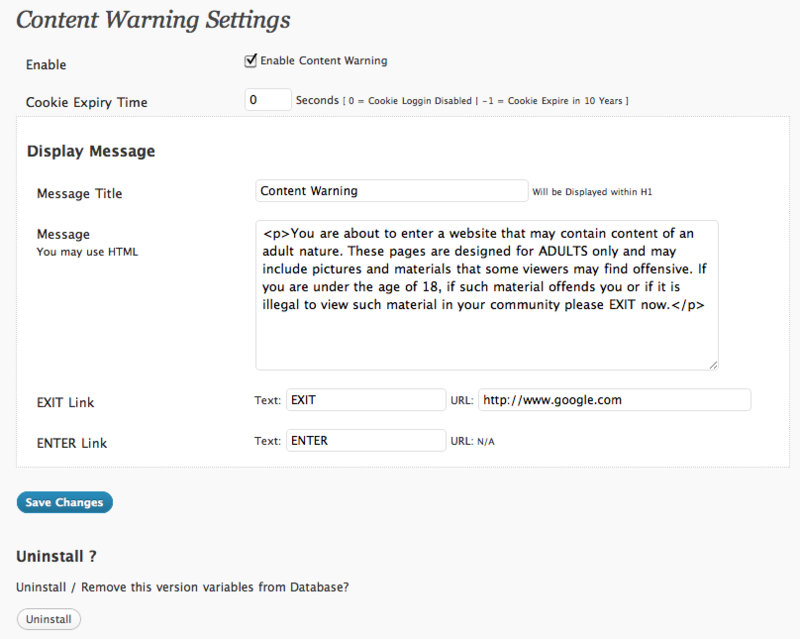 The title and text in your warning can be modified on the “Content Warning Settings” page. In order to change the colors or styles, you should take a look at wpcw.css file. Content Warning will need an exit URL to make sure your visitors are sent to a safe page when they try to exit. Users can choose the length of their cookie’s lifetime. Overall, this is a pretty solid tool to warn your audience with if you have objectionable or mature content on your site. I did notice it does not work for WordPress 3.5. Is that what you are using?